Did you known that 30 times as much money has been invested in Print 2.0 technologies worldwide than in pure Web 2.0 applications? Yes? – And: Why is that the case? Because Print 2.0 is primarily design to improve every kind of business communication and therefore to secure short-, mid- and long-term business success. Companies and organisations of every type expend 15 to 25 percent of their turnover on business communications including every form of promotional communications. That is why Print 2.0 puts the economy in a position to link communications and transactions, i.e. to integrate supply and demand without the requirement for mediators in the classical sense. Beyond the technology innovation: what is strengthening the positioning of print in the communication matrix? › We have to change perceptions about print as a medium and demonstrate coherently how print can be integrated perfectly well into the communication matrix. Like every other medium, print can only develop its full effect if it is deployed professionally and expediently and exploits all practical innovative options. › New technologies are opening up new dimensions in terms of the way we consume information, whereby print is not simply a technological process that was subjected to innovation but rather print is a strongly expressive medium with communication and feedback effects, which can virtually never prove effective in this form. › Print is used in context with other media, whereby print provides a unique customer experience due to the fact that personal experience can be reinforced in a special way through haptics and feeling. 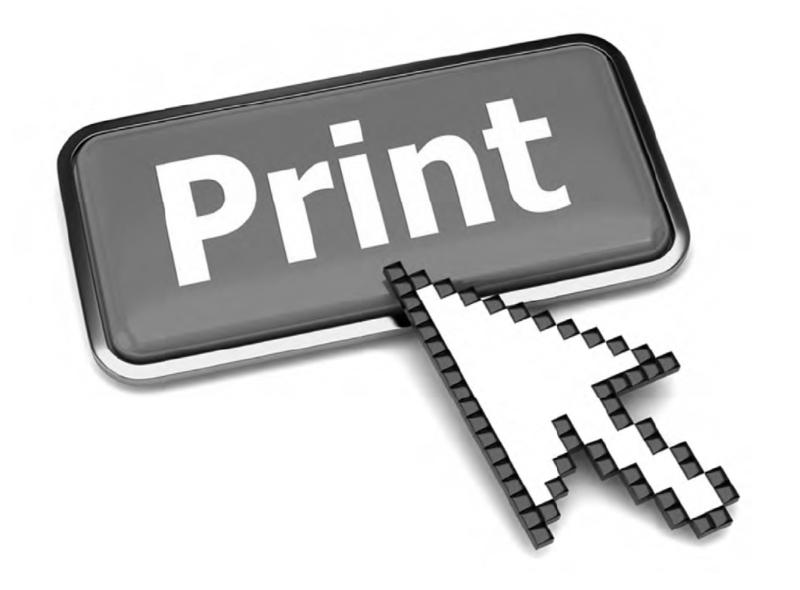 › The future of print is digital whereby digital print can achieve more than online and virtual. › The future of content/information is moving away from an emphasis on mass communications and is bringing the personal interests of the recipient — and therefore the relevance — into focus. Digital print provides everything necessary for this. › Digital print increases sustainability and avoids waste paper by helping to transmit the right messages to the right recipients in a relevant form. › Last but not least: as the global population is growing there is no doubt that the volume of print will also be able to increase provided it is possible to change the printed content in such that the contents are relevant and address the consumers’ needs and interests, which various technologies are making possible. Only then will contents also become usable. And what is not relevant will no longer be printed. The print sector is currently undergoing profound structural change. At first sight the impression could be reinforced that things are not looking particularly good for the disciples of Gutenberg. The business volume is shrinking under the influence of a multitude of factors, the most significant of which is the continuing Internet revolution. The national economies of the USA, Europe and Japan are limping along in terms of growth. And subdued economic development always has a direct impact on print volume. So the challenge is to achieve growth beyond the stagnating traditional print markets. This will not happen just through innovative technologies alone but rather through their expedient application. New applications are required to reintroduce a sense of dynamics and prosperity into the print sector. These applications must enable the generation of so-called true-value-pages, which differ from mass productions in print. For mass productions are highly unlikely to enable earnings opportunities for everybody: the associated print volumes are decreasing and the excess supply is increasing competition. ›The Fewer the Better‹. That means that printing houses and their customers should focus on the type of print production aimed at class rather than mass inasmuch as the printed material really provides added value rather than adhering to old habits. The fact that this actually works can be seen by the example of HP and their customers: there was a 20 percent growth in the volume of printed pages during 2011 across HP’s entire digital printing systems portfolio (i.e. Indigo and Scitex), incidentally spread evenly across all regions of the world. Whether or not one can place too much stock in these figures, the fact is that the polarisation between traditional (analogue) and digital print productions is clearly delineated: analogue is shrinking whilst digital is growing strongly. And from decades of personal experience one can confirm that the growth explosion in digital print has already been going on for a long time, is unstoppable and cannot be reversed. On the contrary: the new values of “everything-now-here-I-immediately” brought about through the Internet revolution can be perfectly serviced by the speed and immediate availability of digital printing technology. Digital print media is deployable and usable quasi ›any time anywhere and on-demand‹. The speed of innovation on the technology side is extremely high. We can all see and feel that on daily basis whether it be through customisation potential with print in direct marketing, photo albums or postcards, labels or packaging and many other types of sales materials. However the true dimensions of innovation in the field of print will only be experienced if not just the early adopters but rather the majority of us make use of it and if we profi t from it directly. The automotive industry, for example, was the first economic sector to have transferred the benefi ts of supply chain management to printed materials: for many years it has already been possible to customize operating manuals to match the specific model purchased by the customer. The print production is precisely coordinated with the timing and production sequence of the car. The manual is then delivered at the precise moment when the car is ready for delivery – no earlier and no later – and of course in the purchaser’s own language. In the meantime other industries have begun to follow this example. For after having been given to understand during the past few years that anything and everything should be virtualized, the need for relevance (and tangibility) has been sparked off. Print can be considered a relevant media if it is deployed and used in the spirit of the true-value-pages philosophy. The fact is that the permanently stressed economic situation is accelerating the preparedness for behavioural changes. Big brand corporations (as the most signifi cant customers for print) need to face up to the change and are doing so. The cost-per-contact maxim is no longer valid, having given way to the notion of cost-perqualified-lead. That is to say: how effective and relevant is my communication? Certainly email campaigns aimed a large number of unknown recipients are extremely cost effective to implement, but in the fi nal analysis do not produce satisfactory results let alone added value. The same goes for newsletter, which in the context of many others of the same sort, are no longer even noticed, or for low-cost POS/POP materials at the point of sale are hardly able to register any effect at all. The fact remains that the above mentioned big brand corporations and even innovative print service providers are improving and expanding their relationships. Certainly that has not yet succeeded in an optimal or in the way it could do, but it is signifi cantly better than it was even fi ve years ago when print was still seen as a matter of habit or even as a medium of the past. Not only can the brand/print-buyer and print service provider relationship be improved by intensifying communications but above all if it proves possible to change perceptions in terms of the advantages of modern print communications. For decades printed materials have been regarded in terms of cost per page or printed product, i.e. purely as a cost factor – and not a modern medium, which reinforces the effectiveness of the modern communications mix. Print was no longer thought of as being robust and profit making. Accordingly the purchasers of printed products focused on the reduction of the cost per page/printed product without evaluating the total costs, including the return on investment calculation as well as supply chain costs. But based on many practical examples from all over the world we know and can document the fact that the way Print 2.0 works can signifi cantly increasing marketing success, if the conception and production of printed materials as well as print-based communication take full advantage of the innovative possibilities of modern digital technologies. Incidentally this does not only apply to business to business marketing activities. Interestingly our observations of HP show that the advantages of digital print are not only meeting with increased interest in the industrialised nations but rather in all regions of the world including emerging economies and the BRIC countries. Innovation in the world of print knows no boundaries. The driving force in all of this are the brand owners, who carry out strategically precise analyses into whichcustomer touch point and sociological/socio-demographic patterns of customer behaviour are relevant. What is crucial in this is that even the so-called always on-consumers of the modern digital epoch can be positively surprised by innovative and relevant customer communications, which include print within the communication mix. In addition to this e-print and cloud print provide a bridge between the mobile and print worlds, whereby the production of printed materials is initiated and controlled via smart phones/tablets. One-for-all publications with static content that is identical for all recipients. High Value Pages (in graphic group 3, right): personalised and/or customised printed pages used in direct mail communications and/or at the point of presence/point of sale. Based on so-called user generated content such as photo albums, blog-to-print or pedia-press (automatic printing of books from Wikipedia) among other things. 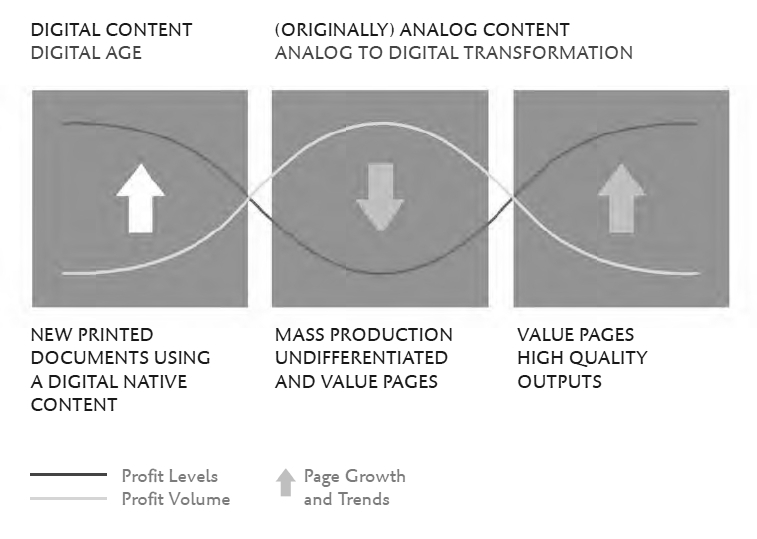 The volume of low value pages will decrease and barely still provide any opportunities to generate profi ts (neither for the purchaser nor for the manufacturer of the printed materials) unless the processes and production means are converted through the use of digital print technologies as are currently being developed in the form of high-volume, high-speed ink jet printing systems. This story is been developed over the last two years by Francois Martin, HP, Worldwide Marketing Director HP Graphic Art Solution Business and Value CEO Andreas Weber. See as well the related video conversation on YouTube.